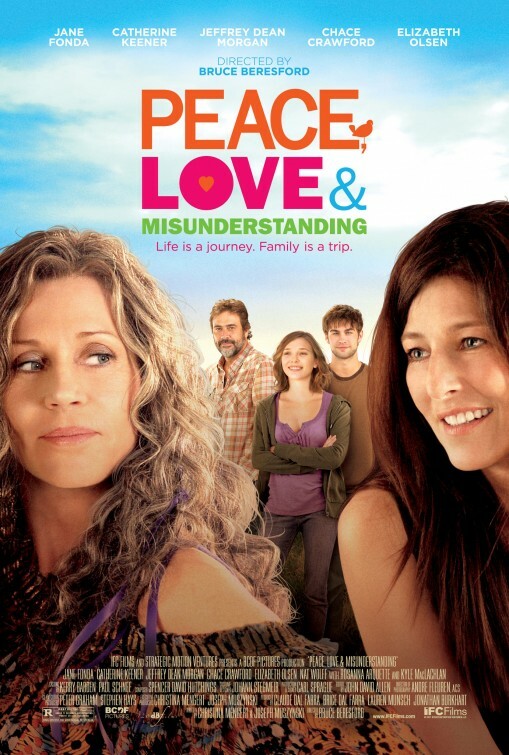 Synopsis: An uptight NYC lawyer takes her two teenagers to her hippie mother’s farmhouse upstate for a family vacation. Review: The last screen outing for Fonda was 2007’s Georgia Rule where starred as a grandmother that lets her granddaughter and daughter stay with her as they cope with their own problems. With the dismal failure of that outing, Fonda seems to have wanted to make things right in Peace, Love, and Misunderstanding. It’s very much in the same vein as the earlier work but while it’s far from a perfect film it does have its moments…and its all thanks to Fonda herself. Before the opening credits roll, Manhattan-ite Diane (Keener) is facing a divorce and decides to take daughter Zoe (Olsen) and son Jake (Wolff) to upstate New York for a long overdue visit with their Grandma Grace (Fonda). How long overdue is this visit? Oh…20 years. The film asks us to get over the fact that Diane would just show up on the doorstep of her mom’s Woodstock hamlet after two decades with little explanation of why. It’s even harder to swallow when Fonda finally gets around to asking two days into Diane’s stay the reasons behind the sudden visit. That the film doesn’t even bother to answer this question is one of the problems behind the basic plot structure. Of all the places that Diane wants to retreat why here and why now? Diane is an uppity NYC lawyer…we know she’s uppity because she wears two piece business suits in the country and has perfectly straight hair. It’s only when she slips on jeans and has a tousled ‘do that we know she’s starting to loosen up and go with the flow. Keener has always been a bit of a distant actress more suited for the hippie-dippy roles such as the character that Fonda plays. If her instinct is to play against type then it was the wrong one – I never warmed to Diane and the baggage she carried with her. As for Diane’s kids, well they are a mixed lot too. Jake is a budding filmmaker so there are numerous shots from his camera’s point of view as well as a few random scenes where he tapes /interviews various points/people of interest in town. Olsen has the right edge for Zoe but, like Keener, seems to be in a more reserved mood for the majority of the movie. Adding next to no inflection to her lines no matter if she’s mad or happy makes for an interesting, if chilly, performance. Nearly everyone has romantic entanglements that are just set-ups to create conflict later in the film…and none of them ring very true. It’s not totally the fault of actors Morgan, Crawford, and Marissa O’Donnell who are involved with Diane, Zoe, and Jake respectively. It’s just that their mere presence seems shoehorned in for maximum discord. Where the film has the most harmony is in Fonda’s performance as the pot-smoking, free-spirited, practicing hippie granny. Instead of dragging the movie into loopy love-child territory (I’m looking at you Wanderlust) she plays the honesty of the character which creates real electricity with anyone she’s in a scene with. Lines that could come off as parody miraculously work in her capable hands. I was most interested in the scenes between mother and daughter where she gives Keener something to act for and truly makes everyone look good. Fonda is part of Hollywood royalty for a reason and she’s the main saving grace of the film. It’s a trim movie that even at 90 or so odd minutes begins to drag as it draws to a close. Director Beresford (Driving Miss Daisy, Tender Mercies) dwells a bit too long on many local yokels and could have jettisoned one of the love interest plotlines for a more streamlined film that doesn’t wear out its welcome. Despite the abysmal title, this ends up being a movie to see for Fonda’s performance and what she can do with a fairly ordinary screenplay.